A nurse at Parkwest Medical Center was honored today with The DAISY Award for Extraordinary Nurses. The award is part of the DAISY Foundation’s program to recognize the super-human efforts nurses perform every day. The DAISY Award was established in 1999 by the family of a patient who had received extraordinary care and compassion from his nurses during his final days. 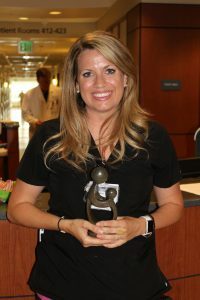 Parkwest’s DAISY honoree for June is Janelle Witcher, RN. Janelle works as a floating nurse within Covenant Health, providing staffing to each of our nine member hospitals. She was nominated by a patient whom she cared for while working at Parkwest, Donna Frangipani. 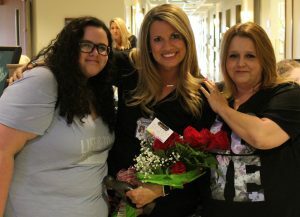 Janelle pictured with Amber (left) and patient Donna (right). Donna nominated Janelle for The DAISY Award. Here’s what Donna had to say about Janelle, “When I got to my room I was instantly greeted by a very “Happy and Kind” nurse, Janelle. She went above and beyond to make sure that I was comfortable and had the best bedside manner of any nurse I have ever come across. I must tell you that you have an incredible young lady on your nursing staff. I was very scared and nervous because I wasn’t able to breathe, but Janelle was very empathetic, caring, and all around wonderful! 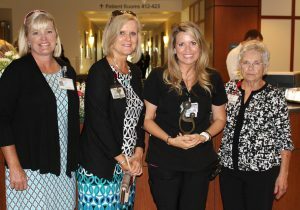 The Covenant Staffing Services team was on-hand to congratulate Janelle on her award. She is the first CSS nurse to be awarded The DAISY Award. Donna and her daughter Amber were on-hand to surprise Janelle during her brief award ceremony today at Parkwest. The DAISY Committee with Janelle. The DAISY Committee presented Janelle with a pin, a certificate, daisies, The Healer’s Touch sculpture, and cinnamon rolls for her entire department to share. Congratulations to Janelle! We appreciate her passion for nursing, and her commitment to always putting her patients first!